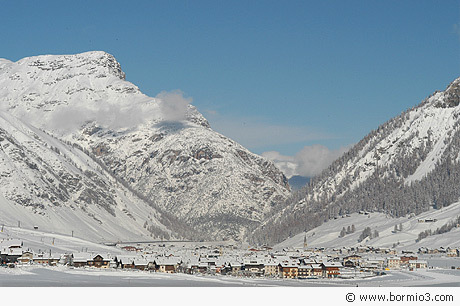 Livigno, a resort village with a population of 5000, is quite a record breaker. To begin with it is 13 km long: a long string of wood and stone built houses and huts, now interspersed with more recent hotels and rented apartments. Secondly, it lies at an altitude of 1.816 m (its remotest huts are as high as 3.000 m.) , and often has the most wintry conditions in Italy: snow is guaranteed from November to May. The average winter temperature of around -10° makers for perfect snow conditions that are, however, rendered perfectly tolerable by the crisp, dry air and good all-day exposure to the sun. Finally, Livigno has seen a truly remarkable tourist boom: between 1964 and 1999 the numbers of hotels rose from 6 to over 1000; and there are now 30 skilifts as opposed to 2 in the 1960s. Visita Livigno in lingua itailana.